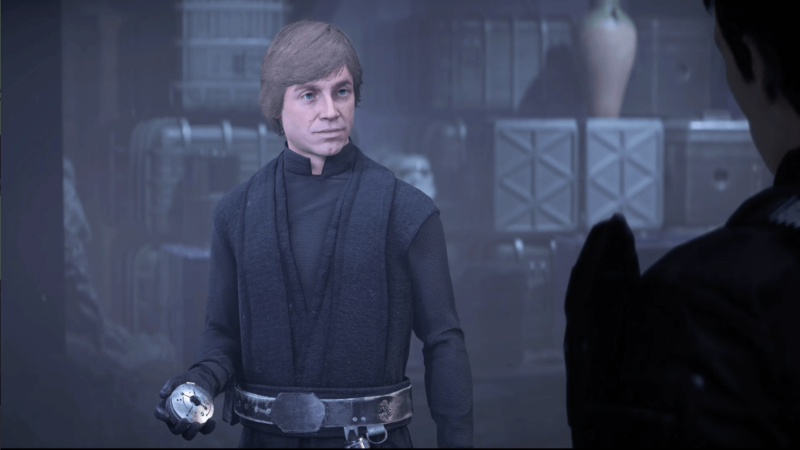 A small Easter egg from The Last Jedi explains exactly how Luke Skywalker found the first Jedi Temple on Ahch-To, where he exiled himself for decades until Rey found him, and it has everything to do with events that transpired in the video game Star Wars: Battlefront II. Spoilers follow for both Star Wars: Battlefront II and The Last Jedi. Back in November, the story campaign of Star Wars: Battlefront II provided fans with details about what happened in the year immediately following Star Wars: Return of the Jedi — and a little bit about what happened right before The Force Awakens. Though it mostly focuses on Imperial Commander Iden Versio as she defects and joins the Rebellion, one-off missions check in with each of the heroes from the original Star Wars trilogy. One particular item of interest that Luke Skywalker recovers during a mission to the planet Pillio during Battlefront II pops up again in his hut on Ahch-To in The Last Jedi. A few months after 'Return of the Jedi', Luke finds the Emperor's hidden vault of treasures and takes this compass. A few short months after the events of Return of the Jedi, Luke is drawn to the planet Pillio by the Force for reasons he doesn’t understand. While there, he encounters an Imperial agent named Del Meeko, who was sent to destroy the Emperor’s classified observatory. They’re forced to work together in order to reach the vault, and even though the Emperor wanted nobody to have anything inside, Del Meeko lets Luke leave with a seemingly harmless compass. Luke calls this a "compass," but what is it really? We previously theorized that this very compass would be what ultimately led Luke to Ahch-To, and as it turns out, we were seemingly correct. The compass popped up in a number of toys and other merchandise related to Luke Skywalker in The Last Jedi. Also, Slashfilm reports that the shooting script for The Last Jedi included a scene explaining the compass that confirmed it ultimately led Luke to Ahch-To. The final published cover for 'The Last Jedi: The Visual Dictionary' features Luke's compass right on the cover. The Star Wars: The Last Jedi: The Visual Dictionary includes hundreds of photos featuring items, characters, and creatures from the movie. Hidden on the final cover in plain sight is “Luke’s Compass” with an “ancient mechanism” inside it. Translation: Fancy space compass can lead you to places across the galaxy. The Last Jedi is now in theaters.